After nearly two years in discussions, the Indian government has finally agreed to push through a long-standing Indian Navy demand for a life extension of at least four of its eight effectively remaining Kilo-class submarines. A deal is to be signed shortly with the Rosoboronexport that involves the upgradation/life-extension of the INS Sindhukesari at Zvevdochka shipyard in Severodvinsk Russia, with the other three boats to be refitted and updated with new weaponry and combat systems at a shipyard in India. A separate contract will be signed at a later stage for the additional three submarines, once a shipyard has been identified. The refit/upgrade move will be the second major programme on the Kilos contracted by the Indian Navy in the 1980s. 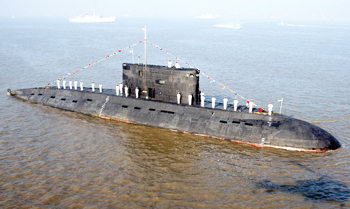 While the submarines remain formidable platforms (Kilos are among the quietest conventional submarines in the world at slow speeds), depletion in strength has severely affected the Indian Navy's submarine arm, given its overdependence on a diminishing fleet of old generation boats. Following the tragic accident on board the INS Sindhurakshak in 2013, it became obvious to the Navy that it needs to fire on all cylinders to rescue the submarine force. The Kilo upgrade, coupled with a speeded up Kalvari-class (DCNS Scorpene license-build at MDL) delivery schedule should go some way in shoring up strength figures ahead of a larger induction of force units.